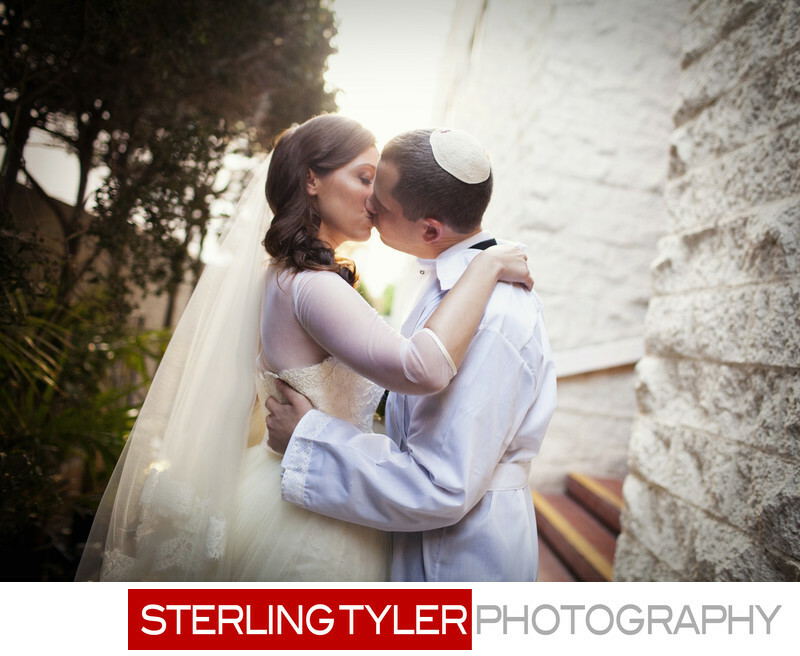 Jessica and Eric enjoyed a passionate kiss just after their wedding ceremony concluded at the Sephardic Temple in Los Angeles, California. The image was captured with a Canon 35mm ƒ1.4 L series lens, mounted on a Canon 5D Mark III camera body. The lens was nearly wide open, and the subject was backlit. We were walking back from the chuppa when I noticed the amazing light. "Kiss her!" I yelled, and they embraced for this epic shot. For those wondering, the groom is wearing a white yarmukle (aka, skull cap) which is traditional for those of the Jewish faith. He is also wearing a white robe called a kittel, which is adorned by the groom only for the wedding ceremony itself. Location: Sephardic Temple on Wilshire Blvd, Los Angeles, California, USA.